Startostar 30-pack metal plant labels, 10.6" x 3.5" x 1.18", made with paint /powder galvanized iron, reusable, waterproof, rustproof and anti-corrosion. ‍30-Pack Metal Plant Labels: set of 30 paint/powder metal labels made with galvanized iron, waterproof, rustproof and corrosion resistance. 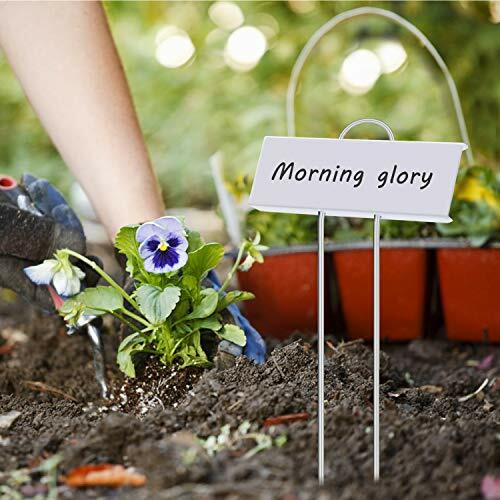 10.6" Garden Markers: total height 10.6", slightly sloping labeling field 3.5" x 1.18". Reusable Nursery Tags: you can mark it with oil-based pen or print a label with your p-touch and laser jet. Satisfaction Guarantee: 45-day no reason return and 1 year warranty, please feel free to contact us via startostar@126.com for any purchase issues. Note: Don't scratches all surface and no engraver, it is easy to rust if the coating scraped off. If you have any questions about this product by Startostar, contact us by completing and submitting the form below. If you are looking for a specif part number, please include it with your message.